Celebrating 75 Years of Service. 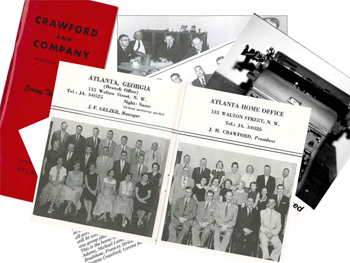 Jim Crawford, an insurance claims manager, founded Crawford & Company® in 1941 with the idea that an independent claims adjusting firm could provide insurers with a cost effective and efficient alternative to in-house adjusters. Crawford & Company has grown from its origin as a small regional operation to one of the world’s largest independent providers of claims management solutions to the risk management and insurance industry as well as self-insured entities, with an expansive global network serving clients and handling claims in more than 150 countries. The Crawford SolutionSM is comprised of comprehensive, integrated claims services, business process outsourcing and consulting services for major product lines including property and casualty claims management, workers compensation claims and medical management, and legal settlement administration.